Smooth, youthful-looking skin can be yours without surgery thanks to injectable dermal fillers, such as Restylane®, JUVÉDERM® and TEOSYAL®. At our London, Ontario, clinic we use these remarkable products to fill lines, restore lost volume, and improve facial contours. Dr. Loo takes a conservative approach to the use of injectables to produce natural-looking results. Getting the best results using injectable treatments requires a cosmetic dermatology specialist such as Dr. Wei Jing Loo, who combines her refined sense of aesthetics with the techniques she’s honed as a board-certified dermatologist to produce visually pleasing results. Specialized fillers developed in recent years enable us to treat specific aesthetic concerns more effectively than ever before. We use the JUVÉDERM family of products, plus TEOSYAL and Restylane Skinboosters, to improve lines, folds, and fullness in the skin. 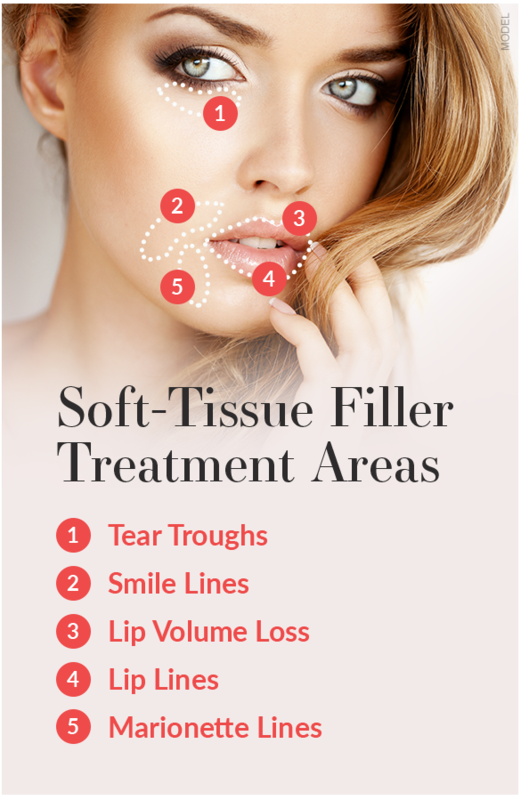 Soft tissue fillers primarily treat wrinkles, folds, and creases around the mouth and in the lower portion of the face. These can include nasolabial folds (“smile lines”), marionette lines that extend down from the corners of the mouth, lip lines, thinning lips, and shallow scars caused by acne. JUVÉDERM: All JUVÉDERM fillers use hyaluronic acid (HA), a molecule that is found naturally in the body. It binds with water in your skin to hydrate it, replenish lost volume, and produce immediate improvements. While these products vary in their uses, which include smoothing wrinkles and sculpting lips, all are safe and provide long-lasting results. JUVÉDERM VOLBELLA XC or TEOSYAL Kiss: Lip augmentation is increasingly popular and VOLBELLA’s unique gel formulation is ideal for the lips. Dr. Loo can add volume and shape to the lips, creating a sensuous appearance without looking unnatural. VOLBELLA can improve thin, wrinkled, or “deflated” lips and reduce the appearance of lines around the mouth for up to 6 months. TEOSYAL Kiss is a great option for improving the contour and providing architecture to the lips. VOLBELLA is better suited for younger patients who want fillers to create pouty lips. VOLBELLA is also approved for the tear troughs and Dr. Loo often uses the filler to treat patients concerned about “bags” under the eyes. Teosyal Redensity II: Redensity II is the first filler developed specifically to treat the tear trough area, where injections can improve the appearance of deep hollows, wrinkles under the eyes, and dark circles. These conditions can create a tired, aged appearance even in younger men and women. Redensity II is one of the best fillers for creating a rejuvenated, rested look. Restylane Skinboosters: This is a unique form of HA that is injected superficially into the dermis and naturally integrates into the skin to improve radiance, elasticity, and plumpness. Dr. Loo will be one of the first in the area to offer this therapy, which may be combined with radiofrequency microneedling and targeted skincare for rejuvenation of the face and neck. Cosmetic dermatologists understand that facial aging involves more than skin losing its elasticity. Gravity pulls down tissue below the skin, and the cheeks and upper face lose volume. The result is an appearance that looks drawn or hollowed out. The middle of the face can appear flatter. Volumizers restore volume to that area and create a lifted look that still appears natural. JUVÉDERM VOLUMA XC: VOLUMA is the first injectable filler approved in Canada and the United States designed specifically to add or replace facial volume in the entire cheek area. It is injected deeper than other fillers and creates a “lifted” appearance. As with all our fillers, VOLUMA XC is pre-mixed with a local anesthetic for increased comfort during treatments. 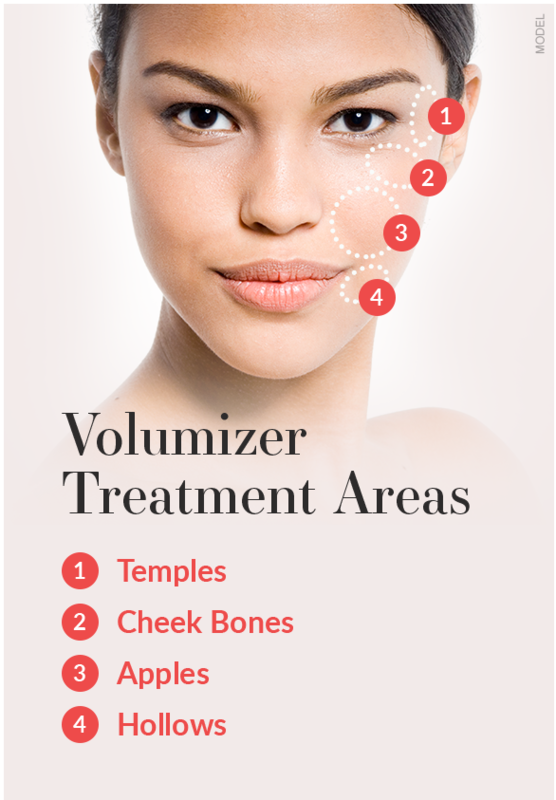 VOLUMA is one of the longest-lasting fillers, with results that may last up to a year or more. Nonsurgical facial rejuvenation can combine injectable treatments, including BOTOX®, with laser skin resurfacing procedures to create comprehensive results. This is a safe and effective approach to improving your skin’s tone and texture with little to no downtime required. You may also want to consider platelet-rich plasma (PRP) therapy for skin rejuvenation. Dr. Loo can recommend a detailed treatment plan after your consultation. Dr. Loo is an experienced, board-certified dermatologist who established DermEffects with a vision of providing excellent cosmetic and medical skin care. What’s the difference between fillers and BOTOX? The injectable treatments work in different ways to reduce wrinkles. Fillers restore facial volume in areas where the natural aging process has etched lines, folds, and depressions. BOTOX treats wrinkles and lines created by the repeated movements of tiny facial muscles — so-called “dynamic” wrinkles. These include crow’s feet at the corners of the eyes, vertical “worry” lines, and horizontal forehead wrinkles. BOTOX is a purified protein that temporarily blocks the targeted muscles from contracting. Fillers produce immediate results, while BOTOX and other neuromodulators take several days to take effect and relax the targeted muscles. What if I’m allergic to fillers? The beauty of hyaluronic acid and calcium-based fillers such as JUVÉDERM is that they are biocompatible, meaning they should not be harmful or reactive within the human body. Purified collagen fillers derived from cows, which are very rarely used now, required patients to be tested before a treatment to ensure they weren’t allergic to the material. How much do fillers cost? As with most cosmetic treatments, the price of a treatment varies from patient to patient based on their specific needs. Dr. Loo takes a conservative approach to the use of injectables to produce natural-looking results. The cost of treatments is based on the amount of filler needed to get the desired results. Patients from as far away as Chatham-Kent and Sarnia travel to DermEffects for JUVÉDERM and other fillers. You can learn more about dermal fillers and the services provided at DermEffects under the expert guidance of Dr. Loo and her team by using the online form to request a consultation or by calling our office at (519) 472-8686 to schedule an appointment.